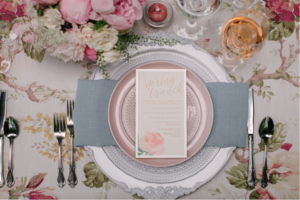 As the flowers start to come back into bloom, bring your social life out from winter’s hibernation and host a dinner party! 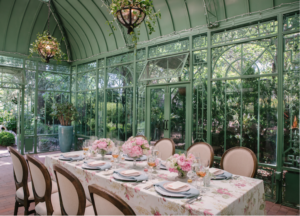 Whether you’re celebrating a holiday, such as Easter, or simply getting together with family and friends, set the right tone for you event with a festive tablescape! We suggest writing down your vision and looking through Pinterest or other sites to get started. decorative items you already have on hand. There is no need to spend a lot of money! Repurposing items or going to the dollar store to pick up decor is an easy way to save yet still design an impressive tablescape! Color trends for 2019 include pale pink, energizing corals, moody hues, and hunter greens. Start with a base such as a linen tablecloth or a table runner. Add depth and texture with plates, napkins, napkin holders, and silverware. Depending on the meal, use anything from a dinner plate and salad plate combination or add a charger for a richer design. Incorporate the freshness of spring with beautiful blooms! Create or pick up a large bouquet to be the focal point, choose smaller arrangements in vases to line the table, or decorate with succulents or plants to add a pop of green! With everything in bloom, fresh greens and florals are easy to find. From your grocery store to your local florist, this is the perfect time of year to bring a pop of color to you table! Depending on your space and theme, candles can also be a great addition to any table to set the mood and add dimension. Don’t forget to include the functional pieces such as salt and pepper shakers, a butter dish, cream, sugar holders, salad bowls and condiments! 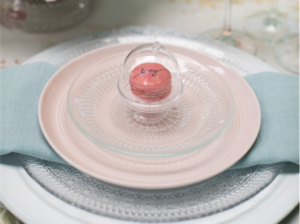 If you want to add a little more embellishment to the table, we suggest place cards or a small gift for your guests! Your guests are guaranteed to be impressed with the time and effort you put into hosting such a special event! Enjoy the evening and the delicious meal you made using your JLD cookbooks! You can now preorder Centennial Celebrations, which includes countless recipes and hosting tips for creating festive tablescapes – no matter the time of year or occasion!